Common Slip and Fall Injuries: Torn Meniscus - Law Offices of David M. Benenfeld P.A. Walking from Point A to Point B is something you can typically do without experiencing an accident. In fact, it is an everyday activity that most of us complete throughout the day without a second thought. Unfortunately, for some people, this common act can result in traumatic injuries from a slip and fall accident. 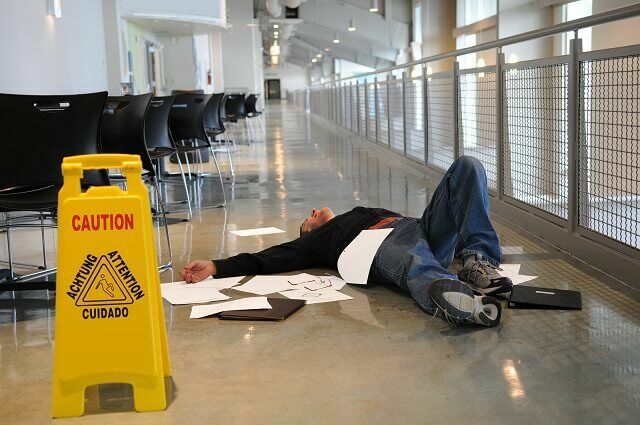 Slip and fall accidents are not taken seriously, but they should be. When you slip or trip and fall on a hard surface, it can cause everything from a traumatic brain injury to chronic pain and knee problems. Slip and trip injuries account for a large volume of emergency room visits each year in the United States; so they happen more frequently than you might realize. One common injury is that of a torn meniscus. Tears to the meniscus are excruciatingly painful, but also can leave you with long-term complications. When someone’s negligence causes you to slip and fall, and you suffer a meniscus tear, you might be entitled to compensation for your injuries. Medial Meniscus – Located on your inside of the knee. Lateral Meniscus – Located on the outside of the knee. Both menisci work to shift weight and distribute it across your leg bones, all while keeping your knee joint stable – and preventing your knees from buckling. When you tear a meniscus, you suffer from limited mobility, extreme pain, and swelling. A tear can occur to either meniscus. Slip and falls can lead to a torn meniscus. All it takes is an injury that involves bending your knee and twisting it forcefully at the same time to split. When your femur grinds against your tibia, the meniscus will instantly tear. The treatment for your torn meniscus depends on how extreme the tear is, and its location. Your age, activity level, and health conditions also play a role in determining how your doctor will proceed with treatment. The outer meniscus has a small blood supply, which helps it heal on its own easier. The inner meniscus does not have a blood supply, which means that it will not improve alone and may require surgery. Before you have surgery, your physician might have you rest and elevate the knee – allowing it time to heal on its own. If the knee cannot heal or scar tissue generates, you may need something more than the conservative treatments. In a slip and fall, especially on a hard surface, you might need surgical intervention. When tears are large enough, they create instability in your knee, and surgery helps remove scar tissue and adequately repair the meniscus. Can You File a Lawsuit Against Someone for a Torn Meniscus from a Slip and Fall? If you have a torn meniscus from a slip and fall injury, and the property owner’s negligence caused the slip and fall, you have the right to seek compensation from the owner. Who is the potential party responsible? Could your injury have been prevented? The owner of the property had a reasonable time to find the dangerous condition and correct it before it caused injury. In other words, they had time to remedy the situation. The property owner caused the dangerous condition that led to your accident. For example, they allowed an obstacle to remain in a walking path and a person could have foreseeably known that it was a danger to leave it there. If the hazardous condition existed long enough for the property owner to react. For example, If the dangerous condition was there for 5 minutes, that might not be enough time compared to a week or more. If the property owner had a policy to check for hazards on his or her property, and if there was a log showing the potential risk. If there was a justification for creating the hazardous condition. For example, if someone is in the middle of construction then there is a valid reason for a hazardous condition to exist. If they took the time to barricade the area but you walked through it anyway, the owner may not responsible. The owner in this instance had justification for creating the hazard and took measures to protect the public, so it is highly likely that no liability would attach. Could the hazardous condition have been made less of a potential danger? Were there other mitigating factors, such as weather, etc? You must also show that you did not cause the accident or that you were not at fault. For example, if you see a “wet floor” sign and choose to run through the area anyway, would you expect the owner to pay for your injuries? The court most likely would not. If you caused the injury or made it worse in some way, you may have your case dismissed, or at the very least some of your compensation reduced based on how much fault you contributed. If you suffered a serious slip and fall accident that tore your meniscus, you are likely in pain – and have medical costs piling up. Speak with an attorney from The Law Office of Law Offices of David M. Benenfeld P.A today to explore your options. We can help you seek compensation for your injury. Meet with us for a free consultation at 954-677-0155 or contact us online with your questions. National Sleep Awareness Month: How to Avoid Drowsy Driving Who Investigates Nursing Home Abuse?